Have you tweeted with your dentist today? Many dentists are now using the power of social media to connect with current and future patients and establishing themselves as expert voices in the field of dentistry! Dentists using social media are taking advantage of a great opportunity to interact with current patients and meet potential patients on sites like Facebook and Twitter. With 1.1 billion Facebook users and 500 million Twitter today, it is the wise dentist who is active and savvy on social media. Social media sites allow dentists to interact with people in a way that’s authentic and relatable. Never before have medical professionals have been able to respond to patients’ questions and even compliments. One of Hay There Social Media’s dental clients learned the power and connectivity of social media recently after this Tweet from a satisfied patient! 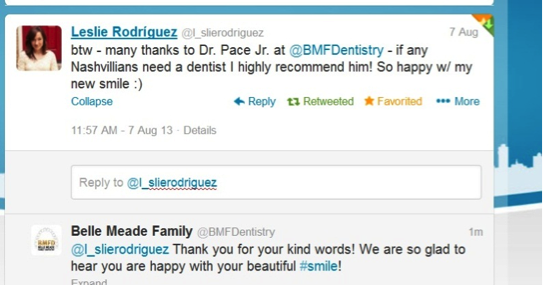 If this dental practice was not on Twitter, they would have been unaware of this tremendous compliment. In this case, the dentists were able to respond and interact one-on-one with this patient. By re-Tweeting this patient’s positive words, this dental practice was also able to share the interaction with their own followers. More importantly, this interaction showed up in the patient’s Twitter feed — alerting her own local followers about her loyalty to this dental practice. That means this client got invaluable free marketing to potential patients! As an expert in the field, dentists have a special chance to educate the public about oral health. Social media allows dentists to educate and share trends and new information at an amplified level. This infographic created for a Hay There Social Media dental client includes the practice logo and was shared through social media outlets – reaching a wider audience. Dentists not using social media should know that they are being left behind and could be missing out on patient questions, reviews and recommendations. Is your dental practice using social media? Are you a dentist with questions about social media? For more information contact Hay There Social Media.